The French know their food, and I don’t believe that anyone would question that. When it comes to the France pavilion in Epcot, you can sit down to a great meal, filled with classic French preparations, or grab a delicious ice cream or a world famous baked good and feel like you have fallen into a food lover’s paradise. However, what if you want something more substantial, a meal on the go, but don’t want to have a full sit down meal? Les Halles Boulangerie-Patisserie has all the pastries you could want, but the main courses tend to get forgotten. Looking for a sandwich as part of your first jog around World Showcase? Les Halles has you covered with numerous options. Perhaps our favorite of the eight sandwiches currently offered is the Poulet au Pistou. The translation is chicken pesto, but there is so much more to this sandwich. 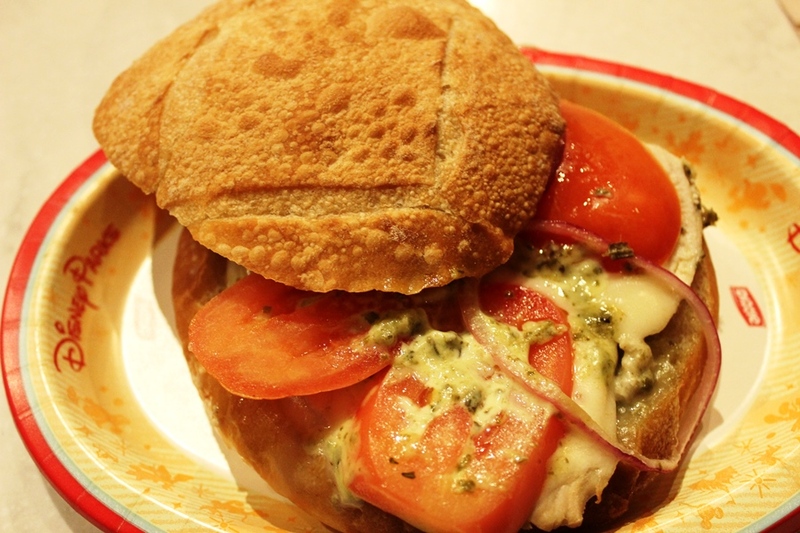 Nestled in a personal-sized round of French bread is a chicken breast, red onions, cheese, tomato, and pesto. Starting with the bread, I don’t believe there is a place on Walt Disney World property that does bread any better. The individual portion here is excellent and holds up incredibly well to the ingredients inside. The sandwich is then layered up with a tender breast of chicken and slices of cheese. Though not listed on the menu, this cheese had all the melty and creamy goodness of provolone. Next comes multiple slices of tomatoes, fresh and thickly sliced. Top everything off with some biting red onion slices and just the right amount of pesto, and you have one amazing sandwich. The kick of the onion plays well off of the savory pesto and sweetness of tomatoes. The cheese not only binds the flavors of the Poulet au Pistou, but it also fights against the sandwich shuffle that usually occurs when tomatoes start to slide off of the rest of the sandwich. Everything comes together to make one perfectly balanced bite. It’s as if the French has been putting bread, meat, and cheeses together for a long, long time. There is a saying that adorns the wall of Les Halles Boulangerie-Patisserie’s seating area, it reads, “Tout ce dont le Parisien moderne a besoin.” In English it means, everything the modern Parisian needs. When it comes to Les Halles, they have everything you need, regardless of where you hail from. The Poulet au Pistou definitely meets that standard, and is one of our favorite sandwiches to grab when we want something delicious, maybe with that French flair, and we’re on the go!